While there is no standard return on investment with SEO that can be applied to every business, virtually every client experiences at least a 100% return on investment with their campaign. Studies have shown that 40% of well managed SEO campaigns yield a 500% or greater return on investment. There’s tons of potential when it comes to SEO, it’s just a matter of making a small upfront investment with a quality SEO company to get the site ranked; Once the site is ranked you’ll start to notice the ROI climb exponentially. While we’ve seen SEO campaigns go wrong and yield poor ROI’s, that certainly isn’t the norm. The vast majority of SEO campaigns yield ROI’s in excess of 100%, and recent studies have shown that about 40% of properly managed SEO campaigns experience ROI’s in excess of 500%. That’s higher than any other marketing mean out there. The specific return on investment that your company will experience depends on your type of business, business model, level of competition and overall demand for your industry. Once we perform your free SEO analysis and consultation, we will have a better idea of the type of ROI you will experience in your respective niche. 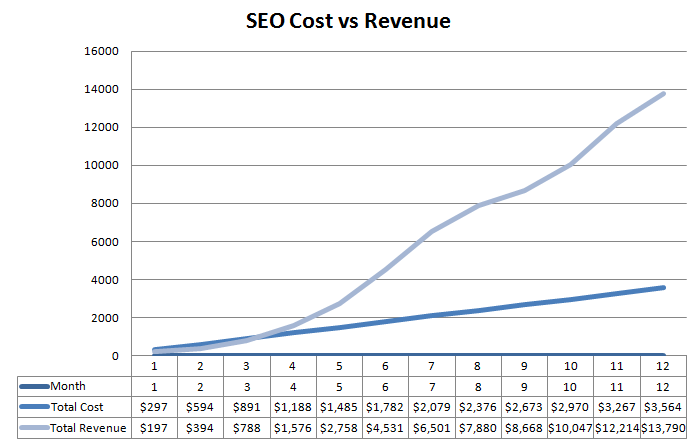 Let’s take a look at the ROI experienced by a company using just a $300 per month SEO package. Initially, the company experienced a negative ROI for the first 2-3 months, which is completely normal with SEO. It takes several weeks before hard results are achieved and reflected. However, once this company was ranked for their 3 keywords, the conversions started flying in the door and after 12 months this company saw a 386% return on their SEO. Now you might be thinking that $13,790 over 12 months doesn’t sound like much of a return, however this brand new, small company only went after 3 medium traffic keywords and is just one example of a proportional return to scale. Remember, the more keywords you rank for, the more traffic your company will see. If you’re ready to learn more about how we can help improve your copmany’s bottom line with our search engine optimization services, sign up for a free SEO analysis and consultation.